Michael and Peter Spirieg’s ambitious Aussie zombie movie is a blast. With innovation and a lot of sweat and tears, the low budget and restrictions turned out looking like an extremely slick big flick. Meteorite fragments from outer space turns ordinary citizens of a small Australian town into bloodthirsty zombies. A motley group of survivors with zero in common have to fight their way through the barrage, while at each other’s throats. Some scenes try a little too hard to replicate American action styles or try to be funnier than it is, while as a whole its Australian identity is well in tact and many scenes end up being quite hilarious or pretty intense. 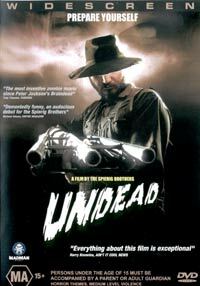 Undead is a riot very much in the vein of Peter Jackson’s early work, and proves how much the application of ideas and hard work can result in something memorable. Loads of extra features: Making Of’s / deleted and extended scenes / Toronto Film Festival screening / internet featurette / camera & make-up tests / dolly construction clip / trailers / several commentary track from cast and crew plus more.